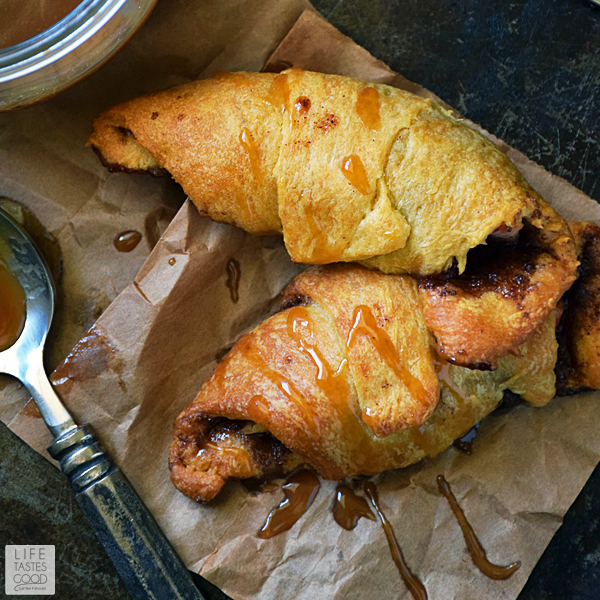 Apple Pie Crescent Rolls - Sweet cinnamon apple goodness tucked inside a buttery, flaky crescent roll and dipped in homemade caramel sauce leaves you feeling all warm and fuzzy! Perfect for Thanksgiving! Apple Pie is a Thanksgiving tradition in most American homes. One year, my daughter (aka the pie maker in our family) made a stunning apple pie! I mean this pie was a thing of beauty with a buttery, flaky crust bursting at the seams with sweet cinnamon-apple deliciousness. A true American classic and perfect for Thanksgiving! Because I was hosting the entire family for Thanksgiving, she made her pie the day before the big event. While preparing our Thanksgiving feast, her pie was sitting on the counter taking up much needed work space, so I picked it up to move it to the dessert table when disaster happened! It just slipped out of my hands and crashed to the floor! Time seemed to slow down as I desperately tried, in vain, to rescue the pie from certain death! Everyone heard the commotion and came running! 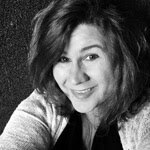 When they saw that magnificent pie smooshed all over the kitchen floor it was as if all the air was let out of a child's balloon. That's right, I had single-handedly ruined Thanksgiving! I'd like to be able to tell you I saved the day by baking these Apple Pie Crescent Rolls, but, sadly, that wasn't the case. 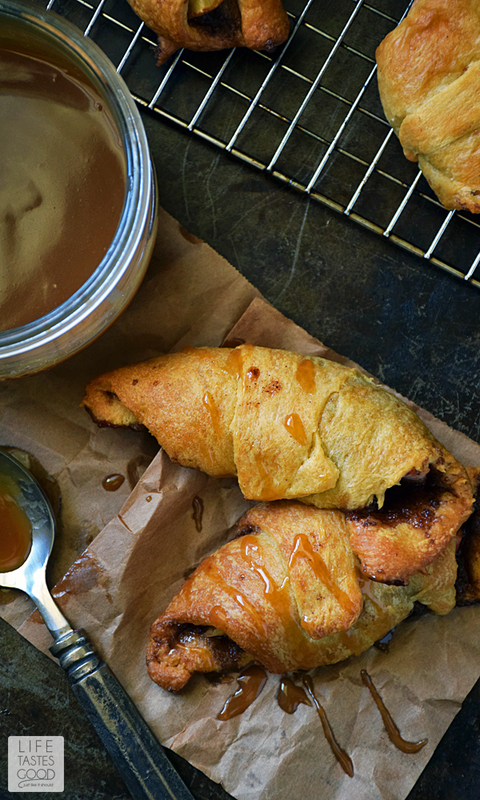 However, if such a tragedy ever happened again, these Apple Pie Crescent Rolls would definitely be the hero! Recently, I was on the hunt for easy Thanksgiving desserts when I spotted the Pillsbury® display at Walmart, and the ideas came flooding in! It doesn't get much easier than having a ready made pastry to fill however you like! 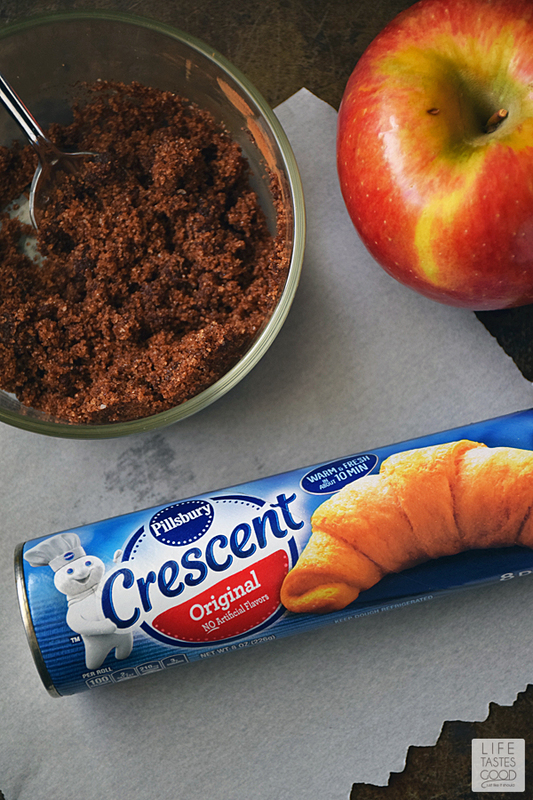 I decided to go with the Crescents® because they are easy to add a topping, roll, and bake. Using Crescents® makes it possible for me to have an apple pie dessert on Thanksgiving and these won't go crashing to the floor! It's an easy recipe that puts a new spin on a traditional Thanksgiving dessert. 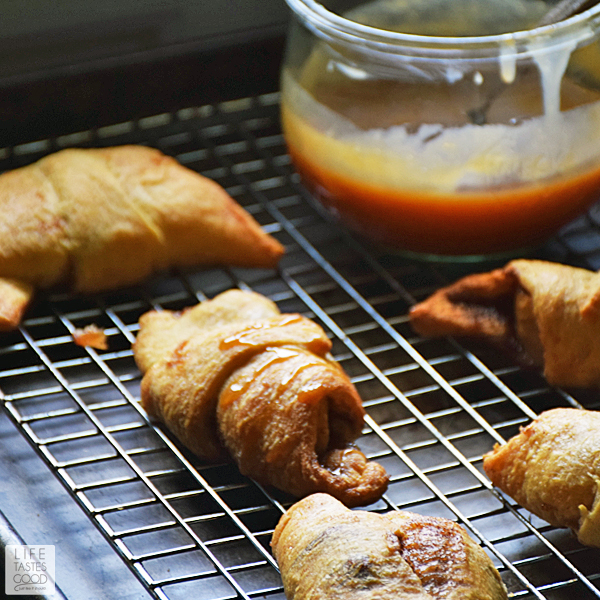 Apple Pie Crescent Rolls will delight and impress family and friends, while saving much needed time in the kitchen! Just what I need for Thanksgiving! 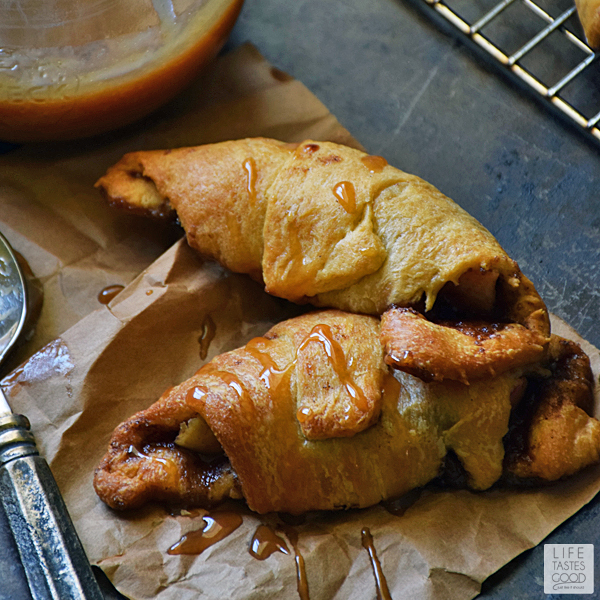 Nestled inside the buttery, flaky Pillsbury® crescent roll is fresh apples, brown sugar, cinnamon, and butter. That's it! So simple, yet so delicious! And super convenient too, because I found everything I needed at Walmart! and 20 minutes to bake. In a small bowl, combine 1/4 cup light brown sugar, 2 tablespoons melted butter, and 1 tablespoon ground cinnamon. Mix well. Unroll Pillsbury® Crescent Rolls and place on parchment lined baking sheet. 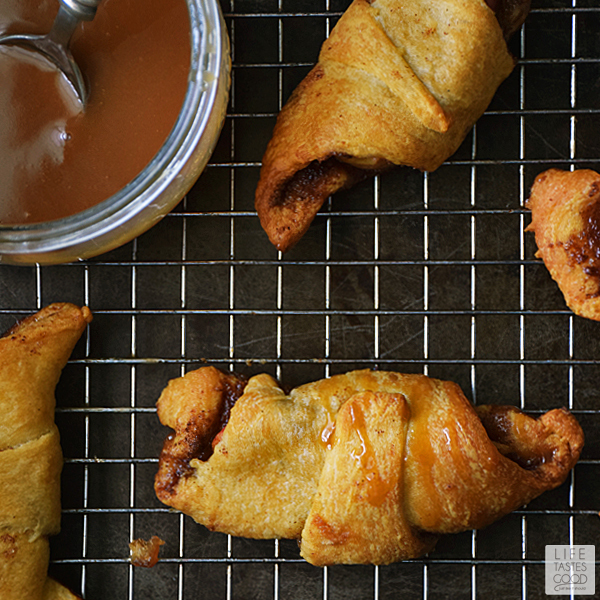 Top each crescent with 1 tablespoon brown sugar mixture and 1 apple slice. Spread the brown sugar mixture all over the crescent and place the apple slice at the wide end. Starting at the wide end, carefully roll each crescent around the apple, keeping the filling inside. Brush each crescent with remaining 1 tablespoon butter and place baking sheet in preheated oven. Bake for 15-20 minutes until the crescents are golden brown and cooked through. Mine cooked perfectly in 20 minutes. Serve with my Homemade Caramel Sauce and enjoy!